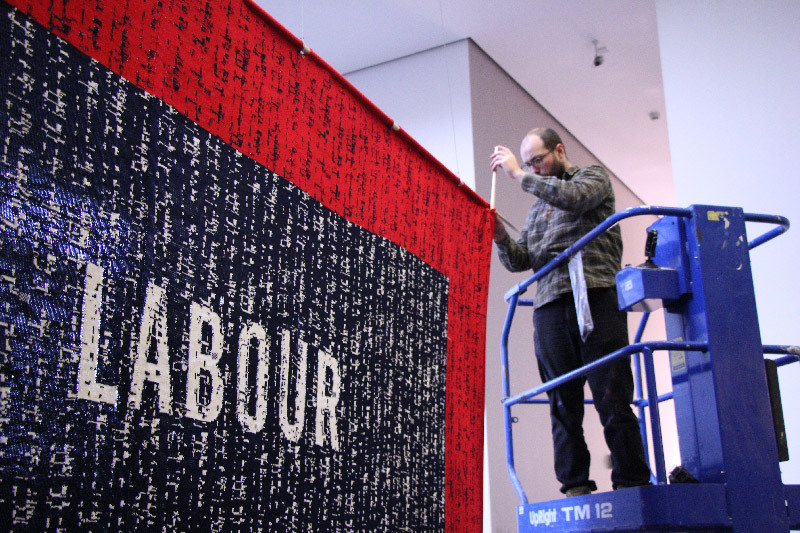 Time & Motion will be the first showing of the completed knitted 888 banner. A Time & Motion Study is a scientific method – developed by Frederick Taylor and later by Frank and Lillian Gilbreth – used to analyse work procedures and determine the most efficient method of operation. This approach has been used extensively in workplaces including factories, hospitals, retail, and banks since the industrial age. Using this as a starting point, the exhibition Time & Motion will use artworks, research projects, archival materials and interventions to track our journey through the world of work, from clocking on at the factory gates to checking in online from our home office or local entrepreneurial networking space. As our industrial economy has given way to a service and knowledge economy, producing ideas and experiences rather than artefacts, how have our patterns of day-to-day working life changed?